The Perpetual Calendar Éclipse by Jaquet Droz presents a spectacular new moon phase display in two models with a resolutely modern design. The Éclipse, a poetic masterpiece of Fine Watchmaking, is one of the brand’s most iconic timepieces. 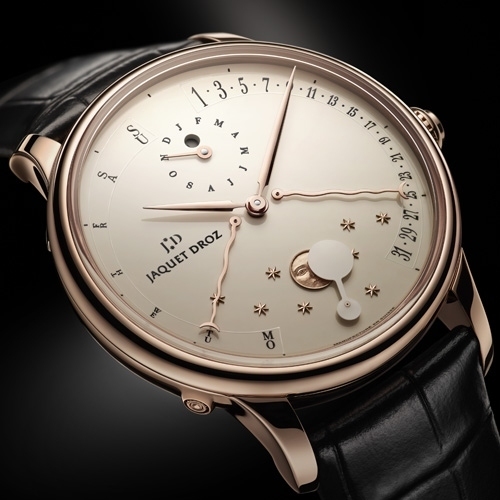 This year, Jaquet Droz craftsmen in La Chaux-de-Fonds masterfully paired the moon phase complication, which displays the fascinating cycles of the night of the sky on the dial, with the Perpetual Calendar: a finely orchestrated union which raises these two complications to a new level of elegance. On the black or ivory-colored Grand Feu enamel dial, two straight hands contrast sharply with the curves of two wavy hands, tipped with a crescent moon. The calendar information is easily read on several places on the dial: on the right is the current date, on the left is the day of the week. At 12 o’clock, a single-hand counter indicates the month with the leap year appearing discreetly in a small window. At 6 o’clock, a black or ivory-colored onyx index moves across the face of a golden moon, revealing, and then concealing it until its total eclipse. The whole spectacle unfolds on a night sky boasting eight stars, the watchmaker’s favorite number.